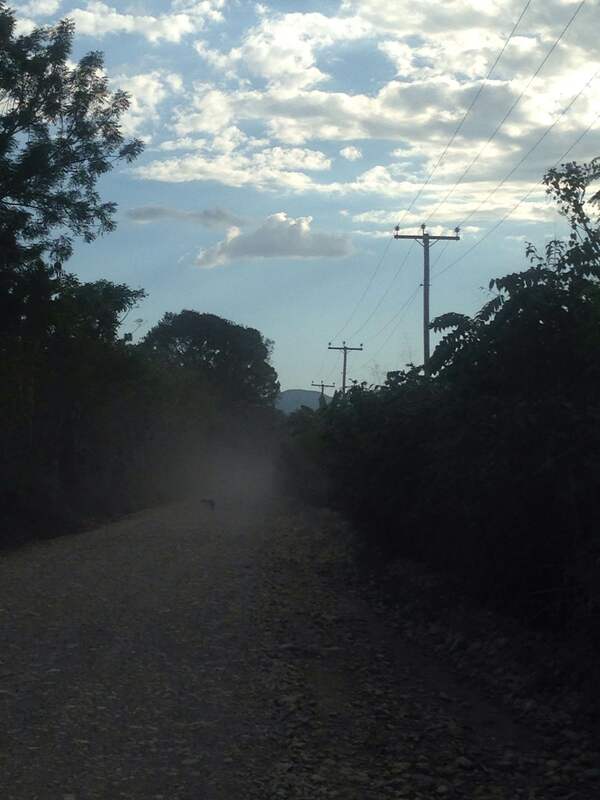 Walking down the white-hot Papaye-Bassin Zim road, I raise my head after a passing truck bathes me in a cloud of dust, and smell the sweet fragrance of the kampechye trees whose tiny yellow flowers poke fingery branches out over the road. Occasionally I catch a last lingering whiff of the sweetgrass smell that I found everywhere in the last weeks of November: a sun-heated, soapy, herbacious smell of rustling seedpods and grasses turning from green to yellow, their stalks waving as tall as my shoulders. I feel the grit of dust on my face, in the corners of my eyes, finding its way through the fabric of my clothes and sneakers. Men carry huge bundles of cane leaves and elephant grass on their heads and shoulders, sharp spears waving in front of their eyes. Goats and horses and cows will eat this forage throughout the dry months. People will add handfuls of leaves to their soup pots, too, in the hungry season, when there is no water to grow fruits and vegetables. I think of the pitimi crop I noticed the other day, when and a friend and I stopped by the side of the road near Mirebalais. Pitimi gate, he says, shaking his head slowly, the millet crop is ruined. 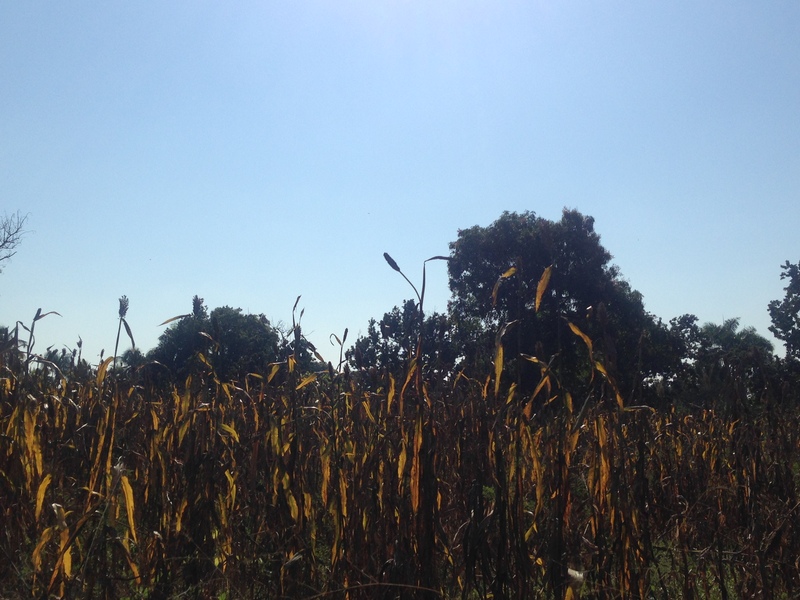 Like the maize crop in September, too many hot, cloudless days have burned the tops of the tall plants. The roots have not been able to take up enough moisture from the soil, which is hard and slick with dust, and when a few raindrops do fall, they hardly have time to soak in before their moisture evaporates. The only sign of the brief night rain that falls every few weeks is the thick, humid air the day after. The sun rises orange and sets pink over the dust-filmed horizon. The February landscape will look like the African savannah, lion-yellow with twisted thorn trees and dry feathery grasses. Prices at the market will rise as fresh food has to travel from more distant, wetter mountain zones. I think about the “meat festival” of New Year’s Day, and the upcoming Mardi Gras of kanaval, when everyone gets to eat meat. On New Year’s Day in Haiti, everyone eats soup joumou, pumpkin soup – no one is to go hungry. A friend tells me that everyone eats soup joumou because it, and all prepared dishes, were forbidden to the enslaved people of colonial Saint Domingue. Masters ate French cuisine, soup, roasts, and wine, while the people they enslaved ate what their provision grounds afforded them: sweet potatoes and yams, ground maize, manioc. In the countryside, peasants wearing their Sunday best and flashily dressed young relatives in from Port-au-Prince walk across the hills to greet friends and family, eating a bowl of silky thyme-scented pumpkin soup, with spaghetti and fat beef knuckles, at each stop. But the first months of the year – the tropical mid-winter – are lean and dry and full of dangers. The dust seems to bring on a never-breaking wave of flus, coughs, and fevers; people and animals get thin and cracks form in hummocked fields as gardens wait for rain. It is a hungry season. Lapli pa tombe – the rain doesn’t fall. The provincial capital just west of where I live, Hinche, sits in a bulb of flat land between two rivers, the Guayamouc and the Samana. Where the shallow brown-green rush of the river hasn’t carved it raw, the reddish earth in the river flats is rich. Banana trees grow thickly and mounded lines of soft ox-plowed earth shelter future sweet potato vines. Some farms have PVC pipes carrying water up from the river’s edge, a luxury in this region where many have to carry the water for their fields in buckets balanced on their heads. But the fields tucked in the depressions between the surrounding limestone mountains – farms “in the air,” as people describe the heights – are turning dry and brown. In a month, the smooth rocks that tumble down the hillsides, which the earth chokes out ceaselessly from its gullies, will be the same dust-yellow as the flattened grasses and the cracked soil itself. When the rain falls again, it will reveal the incredible colors of the washed stones, as smooth as river rocks, malachite green, violet, and rich ochre. “Infertile” is the word I see most commonly associated with Haiti’s soils. The mountainous topography and the island’s seismic instability contribute to the formation of shallow soils which are “inherently fragile” (Bargout & Raizada 2013: 2). On the Central Plateau, in particular, the topsoil is thin over a limestone base, and runs the risk of salination as nutrients leach out when rainwater washes down the steep slopes that ring the Plateau. While this region of Haiti, a semi-arid zone in the rainshadow of the Dominican Republic’s Cordillera Central range, was probably never able to sustain dense tropical forest, its xerophytic flora includes hardy trees like campêche and acacia, whose shallow root systems can sip water slowly across the dry months. Before the land reforms that incorporated this region into Haiti in 1844, large herds of cattle grazed the plateau. In the later 19th century, the state appropriated the majority of large landholdings, while peasants worked tiny plots of land they gained by inheritance, sharecropping, or squatting. 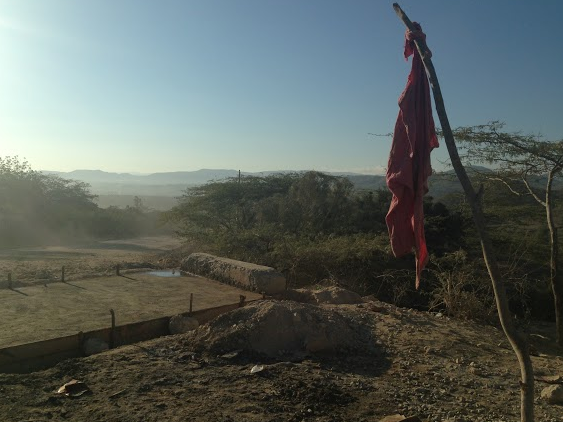 The complex history of deforestation in central Haiti is a story I’ll leave for another blog post, at the least. What is certain, however, is that the unusual geography and land use patterns of the lower Central Plateau pose particular challenges in surviving the season of dust. This season augments the bitter taste I often sense in concepts like “resilience.” I think of the message above the arched gate to the cemetery I pass when I go in to Port-au-Prince: remember that you are dust. I think of the clouds of cement dust that must have risen from the rubble after the earthquake, whose 6 year anniversary is tomorrow, 12 January 2016. “Resilience” is a violently abstract way to describe small farmers’ capacity to survive increasing months without rain, despite their proximity to water made inaccessible across barriers of capital, geography, or enclosure. Remaining alive is resilience, in the narrowest sense, a reality reinforced every time I exchange greetings with peasants I meet on narrow dirt paths: “we’re here, we’re in the struggle” they say to my query of “how are you?” – waiting for the rain in the empire of dust.